Many people wonder, "How does yoga teach you spirituality?" The answer is quite complex. Since each individual pursues faith on a personal level, there's not one definition that applies to everyone. 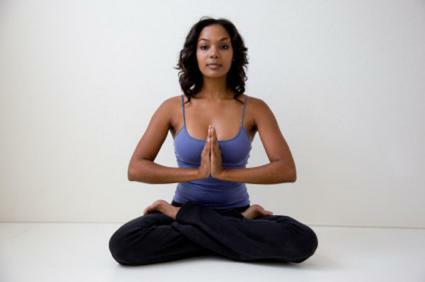 However, many people have experiences of expanding their spirituality through yoga. To explore spirituality is to acknowledge what is beyond our basic existence. Understanding yourself through self-discovery and self-awareness may seem egocentric on the surface, but many gurus believe people on this journey reach a higher sense of enlightenment. Performing yoga is one of many paths that may help people along this journey. One of the primary controversies surrounding yoga and spirituality is that you must practice Hinduism, the religion of ancient yogis. But the modern view of yoga encourages people using the historic philosophies to reinforce their individual beliefs in order to honor and become more true to their faith. Around the world, people of all cultures and religions practice yoga in varying degrees, thus reinforcing the foundation to unite. If the practice of yoga helps you to find peace, to heal your body, and to create a better sense of wellbeing, it's only logical that you become more accepting of your spiritual nature. This realization not only gives your practice more depth and meaning, but also embodies your thoughts, actions, and purpose. You'll lead by example and honor your beliefs. How Does Yoga Teach You Spirituality? One answer to the question, "How does yoga teach you spirituality?" may be that the act of centering and calming the mind allows you to listen to your inner self, the essence most connected to the universe. Beginning yogis may find this a perplexing state, wondering what they're listening for and what message they can expect to receive. Start with something tangible, such as the definition of Namaste. At the end of each class, your instructor may lean toward you slightly and say "Namaste." Loosely translated, this means there is a divine light within each of us. Nama means "bow", as means "I", and te means "you." So, more literally translated, Namaste means, "I bow to you" or "I acknowledge that the light that shines within you also shines within me." This connection between others is the first step toward uniting with the universe as a whole. Each religion offers guidance regarding the acceptance of your fellow beings as a means by which to honor your creator and your beliefs. To learn more about how yoga and spirituality unite, research the history of yoga regarding The Eight Limbs, or Steps, of the Yoga Sutra, designed to join the mind, body, and soul to one purpose.One of the eight limbs, the Yamas, reinforces truth and morals. It's the governing body, if you will, that guides our thoughts and actions. Another one of the steps, the Niyamas, help us achieve contentedness. Dhyana provides us the means with which to meditate with intent. Through gradual study of all the limbs, you begin the path to enlightenment. Learn more about this process in the Yoga Journal article, The Eight Limbs. Classical yoga has five paths of practice, each with a spiritual component. Increasing your knowledge of one or more of these paths is another way to use yoga to enhance your beliefs. Hatha: The physical preparation of mental and spiritual pursuits. Karma: The lesson of selfless giving. Bhakti: The individual relationship with a creator. Raja: A rigorous dedication to the Yoga Sutras. Jnana: A difficult path, this explores all levels of spirituality. It's important to remember that yoga is one of many tools that can help you lead a full and meaningful life. Find joy in daily practice, seek the fellowship of classmates, and use the stillness found on the mat as a centering point off the mat.